August 10, 2018 – Violent attacks on Sikhs in America continue unabated, fueled in no small measure by a rising tide of intolerance and an ingrained ignorance. In one week alone, two turban-clad men have been brutally beaten in California, a state that boasts the largest concentration of Sikhs in the country. Sahib Singh Natt, 71, was viciously attacked Monday morning by two black teens who allegedly demanded money. 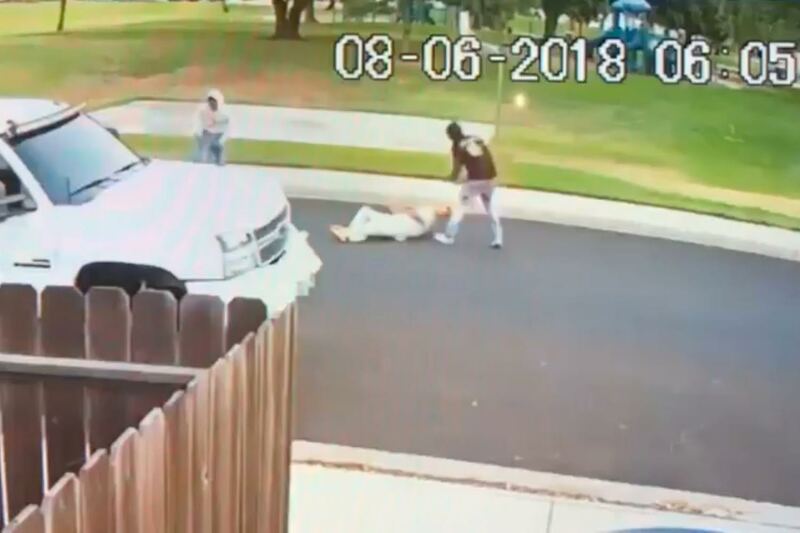 A surveillance video from a nearby home shows the suspects beating, kicking and spitting on the elderly gentleman who fell to the ground, his turban ripped off. The assault which could very well be a hate crime happened in broad daylight in a Manteca neighborhood. The assailants were apprehended Wednesday and it is shocking to learn that one of them, Tyrone McAllister, is the son of Union City Police Chief Darryl McAllister. Authorities announced that they have arrested McAllister, 18, and a 16-year-old boy in connection with the attack on Sahib Singh. The charges are attempted robbery, abuse of an elder, and assault with a deadly weapon. A few days earlier, on July 31, two men attacked Sikh activist Surjit Malhi, 50, in the Turlock area. Malhi was putting up campaign signs for Jeff Denham, a Republican congressman running for re-election, when he was ambushed by white supremacists who threw sand in his eyes before physically attacking him, and spray-painted ‘Go back to your country’ and a white nationalist symbol on his truck. Law enforcement officials are investigating this incident as a hate crime. In a press release, Monday, Congressman Denham stated, “Surjit Malhi is a respected leader in our community and a proud American. He will continue to chair our Sikhs for Denham Coalition”. The California lawmaker underscored, “Inciting violence because of race, religion or political beliefs should never be tolerated. This is the third incident in less than two weeks where a member of my team has been a target and it must come to an end. Hate crimes have no place in our society. The people responsible for this reprehensible act of hatred must be brought to justice”. Regarding his response nearly one week after the despicable hate crime, Denham explained that he and his staff were aware of the incident, but did not release a statement earlier “out of respect for the privacy of our friend and supporter Mr. Malhi. I spoke to Surjit while he was in the hospital after the attack”, the lawmaker revealed. Democratic Congressman Raja Krishnamoorthi of Illinois said in a press statement that he “was appalled to learn of the attack on Mr. Malhi last week in California at the hands of men motivated by hate and committed to a vision of our country that turns its back entirely on its most important values: inclusion. In this assault on Mr. Malhi, we have seen the worst of our country, but not its true nature. The true American spirit of inclusion and unity has been exemplified by Mr. Malhi’s own commitment to his community through his work on behalf of the homeless and victims of wildfires, just as much of his community has shown that same spirit in rallying in support of him in recent days”. Krishnamoorthi, one of four Indian-American legislators serving in the US House of Representatives, noted, “The men who attacked Mr. Malhi told him to ‘go back to your country’. This is Mr. Malhi’s country, just as it is any other American’s who lives a life of dignity, inclusion, hard work and service”, the lawmaker said. It is important to note that these recent attacks are not stray incidents; they are part and parcel of a disturbing trend of violence against Sikh Americans post 9/11. The public remains largely ignorant about Sikhism which is among the world’s major religions together with Christianity, Islam, Hinduism, Buddhism and Judaism. And now the community is once again shaken to the core during a time of remembrance for victims of the massacre at the Oak Creek Gurdwara in Wisconsin. On August 5, 2012, a white supremacist named Wade Michael Page went on a shooting spree killing six worshippers before pulling the trigger on himself. Not much has changed since that fateful day some six years ago. Dr. Rajwant Singh, co-founder of the National Sikh Campaign (NSC), a non-profit organization dedicated to educating Americans about Sikhs and the myriad contributions they make, stated, “We are disturbed and appalled by the recent attacks on Sikh Americans. The fact that Sahib Singh was assaulted and had his turban ripped off his head should be a peaceful call to action for our community and the many supporters of our campaign – Sikhs and non-Sikhs alike – to take a more active role in combating hate. This situation serves as a painful reminder that there is still much work to be done in bringing Americans of all faiths, color, and communities together”. Dr. Singh noted, “Our nation is going through an incredible time of polarization and hateful rhetoric has been increasingly inserted into public discourse. The Sikh community can be an easy target for people who are either enraged or misguided. We hope that civic sense prevails in this nation and we continue to make this nation stronger and more harmonious”, he said. Gurwin Singh Ahuja, executive director of NSC and a practicing Sikh, pointed out, “We wear our turbans to stand up against inequality, injustice and poor treatment of the oppressed”. About the campaign, he said it was launched last year so “more Americans could hear about their Sikh neighbors, what we stand for, and the contributions we make to our communities”. Malhi is well-known and well-liked in his hometown. 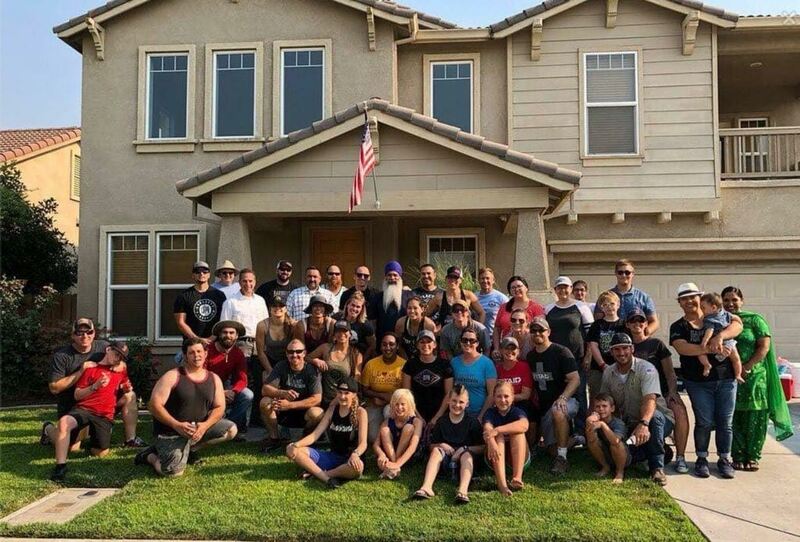 Following the attack on him, a group of people from a CrossFit gym he frequents came to his house offering their full support and helped clean the spray paint off his truck. A heart-warming post from the gym’s Instagram account (CrossFitParaBellum) read: “Surjit Malhi is truly loved and today we helped him realize he belongs here in America just like the rest of us. Our ParaBellum family dropped everything to come out and clean up his truck and yard. Helping hands brought love and compassion into the life of a man that has helped our community from day one. Love will always conquer hate! Our family will not be broken and we will always stand by each others side”. Police Chief McAllister penned a lengthy Facebook post after learning that his “estranged” son was suspected of assaulting Sahib Singh. He noted that “the greater Sikh community is devastated” by the “horrific crime”, and on his part averred he is “completely disgusted” with his wayward son’s actions. The police chief recalled how the “71-year-old Sikh man was accosted by two young men as he innocently walked down a Manteca sidewalk next to a park. The two men confronted the man, apparently in an attempt to rob him, but when the elder did not cooperate, one of the men violently kicked the man in the chest, catapulting him to the ground, and then kicked him again several times as he lay defenseless on the pavement”, he wrote on the social media site. “Words can barely describe how embarrassed, dejected and hurt my wife, daughters and I feel right now”, he stated. “Violence and hatred is not what we have taught our children; intolerance for others is not even in our vocabulary, let alone our values. Crime has never been an element of our household, our values, nor the character to which we hold ourselves”. McAllister revealed how he and his wife worked with the Manteca Police Department to track their son down and arrest him. “He now faces serious felony charges for which, if convicted, he stands to spend a considerable amount of time in prison”, the police chief said. “My family is shaken to the core”, he wrote. “It’s difficult for us to comprehend how one of three kids who grew up with the same parents, under the same roof, with the same rules and same values and character could wander so far astray”. “In the eyes of the public, no matter the irrelevance to the incident, the fact remains that the father of the perpetrator of this despicable crime is a police chief, period. One cannot expect the general public (our Sikh community in particular) to factor in any sentiment that would distinguish this from the integrity of my family name. I pray that we, as a community, in conjunction with my family, can get through this and be even stronger as a result”, McAllister stated.